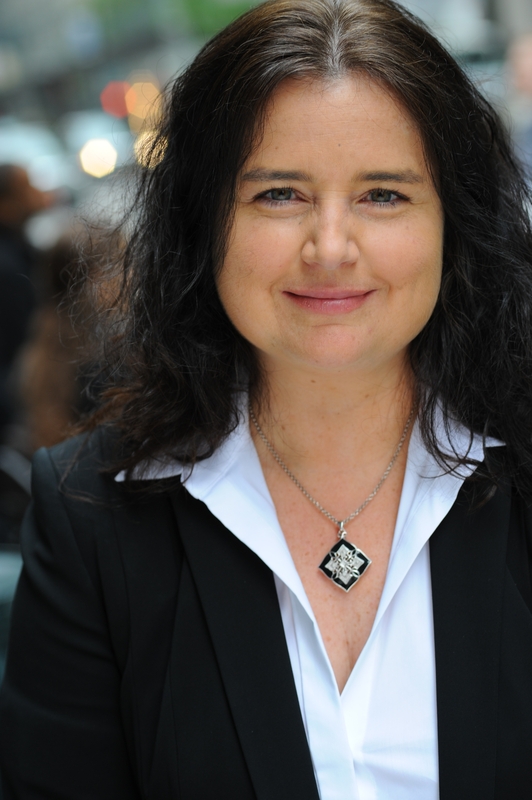 I am so excited to introduce you to author, Dina Santorelli. I really enjoyed her first book Baby Grand and cannot wait to read the sequel, Baby Bailino! Not really. We were more of a movie and TV show family. My mom took me to the local theater every Saturday to see a Disney cartoon and feature film. When did you first know you wanted to write a book? I think I’ve always been drawn to storytelling. I’ve found pieces of colored construction paper filled with stories I wrote when I was very young. And the stories were always thrillers—suspense-driven, edge-of-your-seat stuff. Not really. I just sit myself down and start to write—or, at least, try to write. Some days are easier than others. Did you map your stories before writing or do you just let the words flow? With my first novel, Baby Grand, I just let the words flow. By nature, I’m more of a “pantser,” as they say—I write by the seat of my pants. But there came a point, about a hundred or so pages in, that I found myself losing focus. And that’s when I put together a very general outline for the rest of the book. Nothing fancy. Just sort of a “this goes in this chapter, this goes in that chapter” kind of thing. That outline served as a roadmap to help me steer my way toward the end of the novel. I used that same process for my second novel, In the Red, which I’ll be publishing soon. However, for Baby Bailino, the sequel to Baby Grand, I made the general outline at the outset and filled it in, elaborated, delved deeper, etc., as I went along. Yes, I’m a freelance writer and editor. I started writing a women’s fiction novel after I finished Baby Bailino, but I have put that aside to write the third book in the Baby Grand Book Series. I have a habit of moving on to something completely different after I finish a book—whether it’s reading one or writing one. After I wrote Baby Grand, I dove head-first into In the Red when, actually, I think my mind was more interested in writing Baby Bailino. I just didn’t realize it. Or maybe I wasn’t listening. It shouldn’t come as a surprise to hear that I struggled through In the Red, which took me four years to finish. I like to think I learned my lesson, so when thoughts started turning toward the Baby Grand storyline again this time around, I listened and put the women’s fiction aside. Did you know when writing Baby Grand that there would be a Book 2? Not at first. I thought it would be a stand-alone novel. However, as I was writing one of the final scenes of Baby Grand, I got the sense that there was more to the story. I could see in my mind’s eye how things would play out, and it was in that moment that I made a major change to the storyline and decided to create Book 2. It’s been two years since Jamie Carter escaped captivity and saved Charlotte Grand, the infant daughter of New York Governor Phillip Grand, becoming a national hero for foiling the kidnapping plot that incarcerated reputed mobster/entrepreneur Don Bailino—the man who abducted and raped her. As Governor Grand considers his candidacy for U.S. president, Bailino inexplicably escapes from prison, and soon Jamie’s fifteen-month-old daughter, Faith—Bailino’s biological child—disappears. 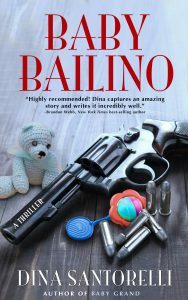 Jamie sets off to find her and, in the process, finds an unlikely ally in Bailino, who is on the run not only from the FBI but from members of organized crime who have a score to settle. Can Jamie trust the man who once held her prisoner? Can she rely on her instincts? And can she again find the strength to save a child when, this time, that child is her own? I remember you telling me that story Brenda. Maybe you should dust that book off and try again:) I enjoyed Baby Grand and I’m looking forward to the sequel. Great interview! And I want chocolate milk now. Congratulations on your freelance writing career. I tried several times but couldn’t get it going. Maybe one day although I do have an Ebook in the works. Fall is my favorite season too. I like the clothes and the weather! I also start shopping for holiday gifts. Thank you all so much for your supportive comments, and a big thank you to Doreen, our lovely hostess! One of the best things about the reading/writing community is that everyone is so supportive and kind to one another — we leave that nasty competitiveness to the tech industries. 🙂 I hope you all enjoy BABY GRAND, and I look forward to hearing your feedback! Happy fall! Thank you Dina and good luck! Wow…great author interview…feels like I know Dina! 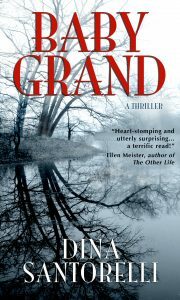 I have not read Baby Grand but will absolutely do it next….and be prepared for Baby Bailino. Ok. any girl who likes chocolate milk? Fine by me. HAS to be a good writer with that inspiration!! She is good. And nice people too! So excited to meet fellow writers! Best of success to you. P.S. I must read these books! Baby Grand was so good, I’m really looking forward to the new one. I *love* hearing about the process of writing! Wishing this author much success!